The Volkswagen Up (stylized as Volkswagen up!) is a city car, part of the Volkswagen Group New Small Family (NSF) series of models, unveiled at the 2011 International Motor Show Germany (IAA). Production of the Up started in December 2011 at the Volkswagen Bratislava Plant in Bratislava, Slovakia. 2 emissions of 79 g/km) and a four-door Cross model. Where the Up concept used a rear-engine, rear-wheel drive layout, the 2011 production model has a front-engine, front-wheel drive layout, using the NSF platform, with a 3-cylinder 1.0 litre petrol engine. A battery electric version, called E-up, was launched in autumn 2013. The Up won the 2012 World Car of the Year. The SEAT Mii and Škoda Citigo are rebadged versions of the Up, with slightly different front and rear fascias, and are manufactured in the same factory. In February 2014 Volkswagen introduced a modified version of the Up for Latin America. The Brazilian-built Up differs from its European counterpart in length (it is 65 mm (3 in) longer), thanks to revisions to the floorpan's rear section to accommodate a larger fuel tank (50L instead of Europe's 35L), a full-sized spare wheel and increased cargo space. 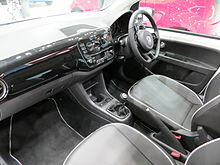 All versions have revised tailgates with a painted metal section (like the Seat Mii's and Škoda Citigo's) instead of the dark glass trim used in Europe. The 5-door Brazilian Up also uses a different rear door design with sectioned glass and wind-down windows. The South American model retains the European version's safety levels with a five-star crash rating and ample use of high-strength steel elements. In July 2015, Volkswagen introduced a new powertrain for the Up sold in Brazil, using a 1.0 L, direct fuel injection three-cylinder turbocharged engine. At the Geneva Motor Show in 2016, the model sold in Europe received a facelift and the new TSI engine, that went on sale in the summer the same year. At International Motor Show Germany IAA 2011 Volkswagen unveiled the final version of the Up based on the Volkswagen New Small Family (NSF) modular architecture. The three-door bodywork is inspired by the 2007 concept UP, the engine range is 1.0 L three-cylinder gasoline 60 hp (45 kW) and 75 hp (56 kW). Both the three and five doors are available with engines running on CNG and called eco-Up. The Up is a front-wheel drive with transverse engine mated to a five-speed manual gearbox and is 3.54 metres (139 in) long has a wheelbase of 2.42 m (95 in). The cabin is configured to four or five seats. The UP is available to order in the United Kingdom since October 2011 for five models – marketed as Take up!, Move up!, High up!, up! black and up! white. British television show Top Gear presenters mock the unusual name by calling the model "Up-exclamation-mark". It was introduced on the German market on 3 December 2011. Deliveries to other European markets began in April 2012. SEAT Mii limited production started in October 2011 for the European market, with sales having started at the end of 2011. The final version was launched in May 2012. The Škoda Citigo was launched in the Czech Republic in October 2011. The Citigo will be sold in other countries of Europe from summer 2012, as well as in Asia (except Japan and Korea where SEAT and Škoda is unavailable), possibly including Russia if it will be produced in Kaluga. Volkswagen up! was being sold in Australia until 2015 due to slow sales. Chances for Škoda Citigo have also been evaporated in Australia. The Škoda Citigo was being sold in Israel and New Zealand for a short time. Volkswagen up! is not intended for sale in North America as well as in CIS countries, Middle East, India, China, South Korea and South-East Asia. Japanese sales began 1 October 2012; it and the Polo are the only two products that comply with Japanese Government dimension regulations. The Up launched in South Africa on 1 March 2015. Two models were offered at launch, both are the 1L 55 kW 3 door variant. The two local options were marketed as Take up! (R133,500), and the Move up! (R140,500). In 2014, at the Geneva Motor Show, Seat presented the 2014 Seat Mii by Mango model designed just for ladies, made in collaboration with the Spanish fashion company Mango. Volkswagen has announced the Up range will be extended to include a production version of the GT Up concept, which will launch in 2013. This will feature a turbocharged version of the 1.0-litre three-cylinder engine producing 110 hp (82 kW) and will look similar to the concept version. An electric hybrid Up — which will be badged Blue-e-motion — will follow. Along with the other two rebadged models, Up is the first car in its class to offer an automated braking system, called City Emergency Braking. The system is automatically activated at speeds below 30 km/h (19 mph), when a laser sensor identifies a danger of collision and activates the brakes. In the SEAT model, the system is called City Safety Assist and in the Škoda model it is called City Safe Drive. In mid-December 2016, Volkswagen allowed journalists to test the prototype of the up! GTI. The car came with 116 horsepower variant of the Up's 1 litre three cylinder engine. In order to add the extra 26 horsepower, engineers had to fit a high-pressured turbo and increased compression ratio of 10:5:1. The car has a top speed of 119 mph (192 km/h) and could get to 60 mph (97 km/h) in 8.8 seconds. Its the only up! to be available with a 6-speed manual. The up! GTI went on sale in 2018. In April 2019, the up! GTI was discontinued in the United Kingdom. 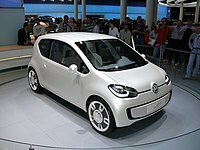 In July 2010 VW announced the production version of the e-up! electric car, with sales scheduled to begin in 2013, and was subsequently unveiled at the September 2013 International Motor Show Germany. The production version has an 18.7 kWh lithium-ion battery able to deliver 160 km (99 miles) on the NEDC cycle, can accelerate from 0-62 mph (100 km/h) in 12.4 seconds and has a top speed of 130 km/h (81 mph). The E-up can be charged with 2.3 kW plugged into any standard 230 V socket, with 3.6 kW via a home-installed wall box or with up to 40 kW plugged into a DC fast-charging station via the optional Combined Charging System (CCS), which allows the battery to charge up to 80% in under 30 minutes. The production version has the same dimensions as the 5 door petrol model with seating for four. Retail deliveries began in Germany in October 2013, followed shortly after by Denmark, Sweden, France, Norway, and the Netherlands, and the UK at the end of January 2014. Pricing in Germany starts at €26,900 (~US$34,500), about €10,000 (~US$12,800) more expensive than the conventional sibling. A total of 1,465 E-Up cars were sold in Europe during 2013. An additional 398 units were sold in January 2014 for cumulative sales in the region of 1,863 units. The market leader is Norway, with 921 units registered through February 2014, followed by the Netherlands with 588 units sold through December 2013. Sales totaled 81 units in France through February 2014, and a total of 40 e-Up! cars were sold in Sweden through December 2013. As of December 2015, there have been 5,056 E-ups sold in Norway alone. Both engines are also available with BlueMotion technologies (SEAT: Ecomotive, Skoda: Green Tech), which incorporates a start-stop system and regenerative brakes to reduce carbon emissions. Depending on markets, some 60PS and 75PS models are available with optional five-speed automatic transmission. The Up ranked third place in the European Minicar segment in 2012, 2013 and 2014 behind the Fiat Panda and Fiat 500. From 2007 through to 2010 Volkswagen showed a number of concept versions of the Up prior to the launch of the production ready version in 2011. The two-door Up concept debuted at the 2007 IAA International Motor Show Germany in Germany, with a rear-wheel drive, rear-mounted, boxer engine and 18 inch wheels. The interior is designed to accommodate four adults, and features flat-folding, air inflatable seats. It also has two monitors on the dashboard, one showing vehicle statistics and the other controlling the in-car multimedia system. The car measures 3.45 metres (11 ft 4 in) in length and has a width of 1.63 metres (5 ft 4 in). 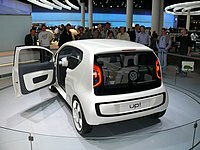 Wikimedia Commons has media related to Volkswagen Up! concept. The four-door four-seater mini MPV styled space up! concept car debuted at the 2007 Tokyo Auto Show in Japan. The Space Up concept had all the features of the first concept, but with four-doors and 23 centimetres (9.1 in) longer at 3.68 metres (12 ft 1 in) (15 centimetres (5.9 in) shorter than the Volkswagen Fox). The 'butterfly' doors open in a similar manner to those on the Mazda RX-8; the front doors conventionally hinged at the front, whilst the rears are hinged at the rear from the C-pillar, eliminating the B-pillar. Its wheelbase is also larger at 2.56 metres (8 ft 5 in) but retains the same width as the Up at 1.63 metres (5 ft 4 in). Also for the first time Volkswagen showed images of its internal combustion engine, a Fuel Stratified Injection (FSI) petrol engine. The four-seater space up! blue concept, the third variant of the Volkswagen Up concept series, debuted at the 2007 Los Angeles Auto Show. The Space Up Blue was visually the same as the Space Up and shared its length and width, but it included a different roof with a 150 watt solar cell which recharges the batteries. This means its height increases to 1.57 metres (5 ft 2 in) and the curb weight is a 1,090 kg (2,403 lb). Twelve lithium-ion batteries give the Space Up Blue 45 kW (61 PS; 60 bhp) of power and a 65 miles (105 km) range. Combined with Volkswagen's world's first hydrogen high temperature fuel cells (HT-FC), range is extended by 155 miles (250 km) giving total range of 220 miles (350 km). The two-door Volkswagen e-up! zero-emissions concept debuted at the 63rd International Motor Show Germany in 2009. The 3.19 metres (10 ft 6 in) long all-electric E-up uses a 3+1 seater configuration. It uses a 60 kW (82 PS; 80 bhp) (continuously rated at 40 kW (54 PS; 54 bhp)) all-integrated drive electric motor, mounted at the front and drives the front wheels. This electric motor generates a torque turning force of 210 N⋅m (155 lb⋅ft) from rest. Power is sourced from 18 kilowatt-hours (kWh) lithium-ion batteries, which will give a range up to 130 km (81 miles). Quick charging will charge the battery up to 80% in an hour, while a regular 230 volt plug will take five hours. The roof of the E-up has a 1.4 square metre solar cell which supplies power to the vehicle's electrics, and when parked can power ventilation fans to help cool the interior when parked in bright sunlight on a hot day. The solar cells can be increased in size to a total area of 1.7 square metre by folding down the sun visors. With a curb weight of 1,085 kg (2,392 lb), it can accelerate from rest to 100 km/h (62.1 mph) in 11.3 seconds; and should reach a top speed of 135 km/h (83.9 mph). The e-up! concept is 3.19 metres (10 ft 6 in) long, 1.64 metres (5 ft 5 in) wide, 1.47 metres (4 ft 10 in) high, and has a wheelbase of 2.19 metres (7 ft 2 in). Interior equipment includes a touch-screen human machine interface (HMI), one notable feature allows the charge to be delayed within the HMI programming, utilising cheap-rate night-time electricity—and this can also be remotely programmed via an iPhone or similar device. Wikimedia Commons has media related to Volkswagen e-Up! concept. Volkswagen Up Lite at the 2009LA Auto Show. The Volkswagen up! Lite was revealed at the 2009 Los Angeles Auto Show. It is a four-seater hybrid concept car based on Volkswagen L1 technologies. The Volkswagen Up Lite concept car has a hybrid powertrain with one 0.8 litres (48.8 cu in) two-cylinder Turbocharged Direct Injection (TDI) diesel engine and one 10 kW (14 PS; 13 bhp) electric motor, using a seven-speed dual-clutch transmission. Its technical dimension is about 3.84 metres (12 ft 7 in) in length, 1.60 metres (5 ft 3 in) in width and 1.40 metres (4 ft 7 in) high. It weighs 695 kg (1,532 lb), has a top-speed of 160 km/h (99 mph), and CO2 emission not more than 65 g/km. 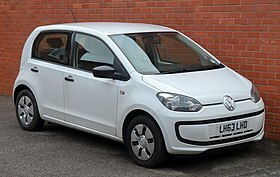 Wikimedia Commons has media related to Volkswagen Up Lite. The Volkswagen IN is a design study created by Brazilian interns of Volkswagen do Brasil which carries a significant resemblance to the Up concept cars. It is a two-seater plus luggage sub-compact capable of adopting a variety of powertrains, including a fully electric one using in-wheels electric engines. The mock-up in 1:1 scale was presented to the press on 29 January 2010. The Volkswagen Buggy Up! concept debuted at the 2011 Frankfurt Auto Show in Germany. The Buggy Up is a dune buggy based on the Up! platform. It is 3,584 mm (141.1 in) long, 1,672 mm (65.8 in) wide, and 1,288 mm (50.7 in) tall. It has a door-less design, convertible canvas roof, waterproof interior, and a reinforced frame with ride height reduced by 0.8 inches (2.0 cm). Wikimedia Commons has media related to Volkswagen Buggy up!. The Up! Azzurra Sailing Team concept debuted at the 2011 Frankfurt Auto Show in Germany. The Azzurra was designed to look and feel like a luxury yacht, with a fully waterproof interior, blue and white leather seats, and chrome and wood trim. The rear seats have wooden backs, so when they are folded down the trunk looks like the deck of a yacht. It has no roof, and wooden railings in place of the doors and rear hatch. Wikimedia Commons has media related to Up! Azzurra Sailing Team. ^ a b c "Intel Report: MQB Architecture at Audi and the Volkswagen Group". Fourtitude.com. Fourtitude.com. 17 February 2012. ^ "New Volkswagen up! Includes Natural Gas Variant". NGV Global News. 21 August 2011. ^ a b c d e "Which Model?". Volkswagen UK. Retrieved 12 April 2012. ^ a b c d e "SEAT Mii brochure March 2012" (PDF). SEAT UK. Archived from the original (PDF) on 5 September 2012. Retrieved 12 April 2012. ^ a b c d e "Citigo Dimensions". Škoda Auto UK. Archived from the original on 11 April 2012. Retrieved 12 April 2012. 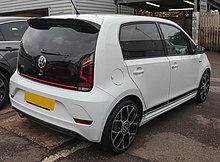 ^ "Volkswagen Up GTI prototype driven - Mk1 Golf GTI reborn?". EVO magazine. 15 December 2016. 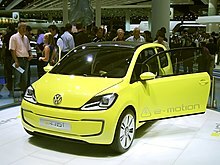 ^ a b "Frankfurt show: VW Up GT concept". Autocar. 13 September 2011. Retrieved 15 September 2011. ^ "New Small Family product decision for Bratislava, April 2009". volkswagen.sk. Volkswagen AG. Archived from the original on 5 January 2012. Retrieved 4 December 2011. ^ a b c d e f g "Volkswagen up! concept". VWvortex.com. Volkswagen AG. 10 September 2007. Retrieved 21 December 2009. ^ "Volkswagen Up! : the design". carbodydesign. 28 October 2011. Retrieved 10 July 2016. ^ "Interview with the designers of the up!". YouTube. Volkswagen. 4 September 2011. Retrieved 10 July 2016. ^ "New VW Up unveiled". Autocar. 21 August 2011. Retrieved 30 August 2011. ^ "Production Plants". Volkswagen AG. Archived from the original on 9 August 2012. Retrieved 11 May 2012. ^ "VW 'up!' joins Latin NCAP's growing 'five star' club of safer cars for adult occupant protection". LatinNCAP. Retrieved 7 February 2014. ^ "up! brings the best of VW engineering in a compact, efficient package (IN PORTUGUESE)". Volkswagen do Brasil. Retrieved 7 February 2014. ^ "BRAZIL: VW Up TSI makes debut in Brazil before Europe". www.just-auto.com. 31 July 2015. Retrieved 7 December 2015. ^ "VW Up! (facelift) launched in Europe". 23 June 2016. ^ "Roll up, roll up...order books open for new Volkswagen up!". www.volkswagen.co.uk. Volkswagen. October 2011. Archived from the original on 15 October 2011. Retrieved 17 October 2011. ^ "Volkswagen Up! will not be launched in India owing to high costs". International Business Times. 31 December 2016. Retrieved 20 August 2018. ^ "2014 Seat Mii by Mango – Perfect Car for Ladies". 2015carreviews.com. 10 March 2014. Retrieved 16 March 2014. ^ Aucock, Richard (27 January 2012). "Volkswagen GT up! concept - Car Reviews - MSN Cars UK". Cars.uk.msn.com. Retrieved 11 March 2012. ^ "Volkswagen up! Blue E-motion to get 95 mpg - report". Worldcarfans.com. Retrieved 11 March 2012. ^ "VW Up vs Seat Mii vs Škoda Citigo: which is the better buy?". Recombu. 1 May 2012. Retrieved 16 December 2012. ^ "New Skoda Citigo facelift". ^ Viknesh Vijayenthiran (8 July 2010). "All-Electric Volkswagen E-Up Coming To U.S. In 2013". AllCarsElectric.com. Retrieved 7 May 2011. ^ "VW Calls Germany's 1 Million Electric-Car Goal Achievable". ^ a b Volkswagen Media Services (5 July 2013). "XL1 and e-up! electrify the Silvretta E-Car Rally". Volkswagen. Archived from the original on 13 July 2013. Retrieved 13 July 2013. ^ "New up! Explore Features : Volkswagen UK". ^ "VW E-Up (2013) review". ^ Mike Szostech. "Volkswagen e-Up Availability". My Electric Car Forums. Retrieved 6 December 2013. ^ Jose Pontes (26 January 2014). "Europe December 2013". EVSales.com. Retrieved 9 March 2014. ^ Jose Pontes (28 February 2014). "Europe January 2014". EVSales.com. Retrieved 9 March 2014. ^ Ståle Frydenlund (2 January 2014). "7.882 nye elbiler registrert i 2013" [7882 new electric cars registered in 2013] (in Norwegian). Norsk Elbilforening (Norwegian Electric Vehicle Association). Archived from the original on 2 January 2014. Retrieved 9 March 2014. ^ Ståle Frydenlund (6 March 2014). "2.562 nye elbiler så langt i år" [562 new electric cars so far this year] (in Norwegian). Norsk Elbilforening (Norwegian Electric Vehicle Association). Archived from the original on 7 March 2014. Retrieved 9 March 2014. ^ Enrique García (2 January 2014). "Las matriculaciones de híbridos y eléctricos alcanzan ritmos históricos en Holanda" [Electric and hybrid car registrations reached historical records in the Netherlands] (in Spanish). AutoBlog en Español. Archived from the original on 3 March 2014. Retrieved 9 March 2014. ^ Automobile Propre. "Chiffres de vente & immatriculations de voitures électriques en France" [Sales figures & electric car registrations in France] (in French). Automobile Propre. Retrieved 8 February 2014. See tables "Ventes de voitures électriques" corresponding to 2013 and 2014. ^ Bil Sweden (2 January 2014). "Nyregistreringar december 2013 prel" [New registrations in December 2013 prel] (in Swedish). Bil Sweden. Retrieved 3 January 2014. Download file "Nyregistreringar december 2013 prel.pdf" see table "NYREGISTRERADE SUPERMILJÖBILAR DECEMBER 2013" with summary of PEV sales by model for 2013 and 2012. ^ "SEAT Mii Euro Ncap 5-star rating". Euroncap.com. Retrieved 27 November 2011. ^ "O VW up! passa a fazer parte do clube de carros "cinco estrelas" em segurança de adultos do Latin NCAP". LATIN NCAP - PARA AUTOS MAS SEGUROS (in Spanish). Retrieved 7 December 2015. ^ "Green NCAP assessment of the VW Up!". greenncap.com. 2019. ^ a b c d e "Volkswagen space up!". VWvortex.com. Volkswagen AG. 23 October 2007. Retrieved 21 December 2009. ^ a b c d e "Volkswagen introduces space up! blue at Los Angeles". VWvortex.com. Volkswagen AG. 14 November 2007. Retrieved 21 December 2009. ^ a b c d e f g h i j k l "Volkswagen e-Up! concept". VWvortex.com. Volkswagen AG. 14 September 2009. Retrieved 21 December 2009. ^ "3+1 seater Volkswagen up! concept EV". PaulTan.org. 15 September 2009. Retrieved 21 December 2009. ^ "LA 2009: Volkswagen Up! Lite Concept teases with practical, lightweight innovation". green.autoblog.com. Weblogs, Inc. 2 December 2009. Retrieved 21 December 2009. ^ "Brazilian interns design new Volkswagen city car concept". green.autoblog.com. Weblogs, Inc. 4 February 2010. Retrieved 4 February 2010. ^ ""Smart" Volkswagen In Micro Car Concept Crafted by VW Brazil Design Interns". Carscoops. 29 January 2010. Archived from the original on 25 July 2011. Retrieved 4 February 2010. ^ "2012 Volkswagen Buggy Up! Concept". conceptcarz.com. Retrieved 11 September 2017. ^ "Volkswagen Up! Concepts". caranddriver.com. Retrieved 11 September 2017. ^ "Volkswagen on the rise with a variety of Up! concepts". autoblog.com. 14 September 2011. Retrieved 11 September 2017. ^ "Scottish car of the Year". Archived from the original on 22 February 2014. Retrieved 14 December 2012. ^ "What Car? Car of the Year Awards 2012". What Car?. 11 January 2012. Retrieved 11 May 2012. ^ "2013 CCOTY: VW Up!". What Car?. 9 January 2013. Retrieved 9 January 2013. ^ Rutherford, Mike (5 April 2012). "VW Up wins World Car of the Year title". The Telegraph. Retrieved 11 May 2012. 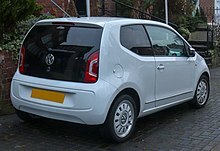 Wikimedia Commons has media related to Volkswagen up!, Škoda Citigo and SEAT Mii.